Despite not playing up to the level which saw her defeat world number three Petra Kvitova in the previous round, Venus Williams battled past Aleksandra Wozniak 4-6,6-4,7-6 to move on to the fourth round at the Sony Ericsson Open. Coming into the third round, these two had a great deal in common as wildcard entries. Wozniak is on the rebuilding path from a wrist and shoulder injury the last two years while Williams missed most of 2011 due to Sjogren’s disease. Wozniak broke to open the match. Leading 2-1, the Canadian salvaged six break points to keep the lead. Although Williams did break later for 3 all, she again surrendered her serve which allowed Wozniak to eventually grab the first set. After being down a break again early in the second set, Williams leveled things at 2 all. A sleuth of breaks followed with Williams ultimately getting the last one to send the match into a third set. Subsequent to consolidating for 4-2, Wozniak had a 15-40 advantage. If the Canadian had converted, she would have had a double break edge. Williams kept close and the next game squared the set at 4 all. However, Williams went down again 4-5 but with help from her rival saved match point. Fighting through an error prone game and match, Williams arrived at 6-5. 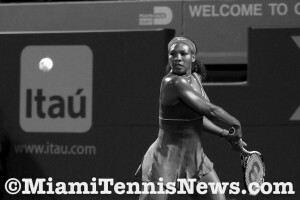 In the end, the winner was settled by a tiebreaker and in spite of her struggles, Williams pulled through with a victory after two hours and fifty minutes. It was the first meeting for these two competitors and a great disappointment for Wozniak who is working her way back up the ranking after plummeting from 35 to 126 at the end of 2011. For the second time this year, she failed to close out a well known opponent, before Agnieszka Radwanska in Dubai. Serving for the match, Wozniak was candid in saying that “nerves played a part” and “not having the right strategy at the right time”. After the match, Wozniak took comfort in her father citing that the important thing is that she’s “healthy and on the right track”. 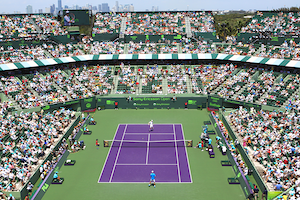 Action at the 2012 Sony Ericsson Open gets under way today with Andy Murray taking on Alejandro Falla on Stadium Court. Murray is hoping for a repeat performance of 2009 where he was the champion in Miami. Top seed and world number one Victoria Azarenka begins her quest to defend her title in Miami when she faces off with Michaella Krajicek. In the night session, three-time Sony Ericsson Open champion Venus Williams goes up against the reigning Wimbledon champion Petra Kvitova. That match will be followed by Rafael Nadal versus Santiago Giraldo. Nadal, a three-time runner-up in Miami is looking to secure his first Sony Ericsson Open title after losing in an epic third set tie breaker last year to Novak Djokovic.